Nokia, which had sold its mobile phone business to Microsoft, is planning to make a comeback into the consumer market. For the same, the company has announced N1, the first Nokia-branded Android tablet. However, instead of manufacturing the device itself, the company will launch the tablet through a brand-licensing agreement with an original equipment manufacturer (OEM) partner who will be responsible for manufacturing, distribution and sales. In addition to the Nokia brand, Nokia is licensing the industrial design, Z Launcher software layer and IP on a running royalty basis to the OEM partner. The OEM partner will be responsible for full business execution, from engineering and sales to customer care; including liabilities and warranty costs; inbound IP and software licensing; and contractual agreements with third parties. "We are pleased to bring the Nokia brand back into consumers' hands with the N1 Android tablet. This is a product for Nokia fans and everyone who has not found the right Android tablet yet," said Sebastian NystrÃ¶m, head of products at Nokia Technologies. While these are brave words, the fact remains that the N1's design is a blatant copy of Apple's iPad mini. The device will be manufactured by Foxconn, the company which also makes Apple's popular iPhones. The tablet sports a 7.9 inch IPS LCD capacitive touchscreen display (2048 x 1536 pixels resolution) and runs on the latest Android 5.0 Lollipop operating system (with Nokia Z launcher interface). It is powered by a 2.3 GHz Intel Atom Z3580 processor and has 2GB of RAM. The internal memory of the device is 32GB, but further memory expansion is not available. N1 has an 8 megapixel autofocus rear camera that can also record full high definition videos (1080p), and a 5MP fixed focus front-facing camera for video calling. On the connectivity front, it has Wi-Fi, Bluetooth 4.0, and a microUSB port. The dimensions of the device are 200.7mm x 138.6mm x 6.9mm and its weight is 318 gm. Nokia has provided a 5,300 mAh battery in the tablet, which also comes with GPS (with A-GPS support). It will be available in natural aluminum or lava gray colours. 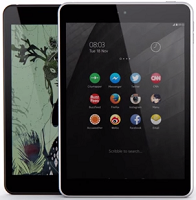 Nokia N1 comes with Nokia Z Launcher, a home screen that allows users to scribble a letter or two to find their content quickly. Plus, it adapts to where you are and what you are doing to bring you the right app, right when you need it. According to the company, over time the Z Launcher learns what applications are in use, and predicts and highlights the applications consumers are expected to want based on time of day and their location. The N1 will be made available for purchase in China in the first quarter of 2015 for an estimated price of $249 (Rs 15,429). Details on its exact pricing or launch date for India are not available as of now. Microsoft Corp had acquired Nokia's (once the undisputed leader in mobile phones) mobile phone business for $7.2 billion last year. Earlier this month, Microsoft had launched its first smartphone sans the 'Nokia' logo. Christened Lumia 535, the device sports a Microsoft logo on the front and back, which was earlier home to the Nokia branding.